The ugly duckling of the analog world gets a chance to morph in to a beautiful swan. If you’re new to the phonographic experience, i.e. approaching it from digital components, the voltage generated by phono cartridges seems silly low. We’re talking about voltages around 5 millivolts (mV) or 0.005 volts for a typical MM (moving-magnet) cartridge. DAC’s and CD players typically output about 2 volts. If you think 5 millivolts is low, how about the 0.5 millivolt output for a typical low-output MC (moving coil) cartridge, that’s 1/10 the voltage of a typical MM cartridge. And there are a few very low output moving coil cartridges that only output a little over 0.1 mV! A quick introduction to the phono cartridge team: High-output MC cartridges (HOMC) have output voltages approaching those of MM cartridges, and can usually be used directly with ‘MM’, i.e. low-gain phono stages. A low-output MC cartridge (LOMC) requires a very high-gain phono stage – or the addition of a SUT (step-up transformer). With very low-output MC’s (VLOMC), a SUT is virtually essential to achieve the voltage necessary to drive a typical phono stage, and in practice is near essential for coupling the cartridge to the preamp for optimum sound and minimum noise. To get all of these voltages up to the level that your line stage (or line-level integrated amp) requires, calls for some serious amplification horsepower. But it isn’t crude power that’s needed. We need lots of low-noise amplification with immunity to external interference. Low-noise power supplies are essential too. And that’s just for an MM phono stage. All of this, hard enough for an MM phono stage, is even trickier if you have an MC cartridge. To our rescue comes a component as old as alternating current itself: the humble transformer. That more or less cylindrical lump on the power pole in front of your house is one. It transforms, anywhere between 550 and 2500 volts down to the relatively safe 120 and 240 volts used inside. An MC SUT is used the other way around. The SUT takes the approximately 0.5 mV and steps it up to around the 5mV that the phono stage is expecting. There’s no free lunch for this transformation. But MC cartridges are good at generating current, if not voltage. The SUT, in essence, converts current in to voltage. There are phono stages that amplify the very low-output of MC cartridges without the use of transformers. That’s not an altogether bad thing, but it takes some dedication to do it successfully. It isn’t just down to price either. To walk out of a HiFi shop with a new ARC Reference 3 Phono under your arm will set you back nearly 20 grand Canadian by the time you pay the tax. Anyone shopping in this price range will likely prefer to select their own SUT for a specific MC cartridge anyway. At the other end of the price spectrum, the humble but willing Pro-Ject Phono Box will do MM and MC cartridges and you’ll typically get out of the door with one of these for under $200 CDN. A transformer should be selected to optimally couple the electrical characteristics of your MC cartridge to your phono stage. Transformers with more than one primary winding, like the K&K Premium, make it easier to get a good match. The switches seen in the photo above configure the two primary windings of each transformer in either a series or parallel connection. The series connection has lower gain and is for carts with a fairly high – in low-output MC terms – outputs. The parallel connection with its higher gain is for really low-output MC’s. To fine tune the coupling even further, resistors can be paralleled with the transformer’s secondary windings. Information on the K&K website is helpful, but if it all seems too much, contact Kevin, Mr. K&K himself, and he’ll help you sort it out. He takes and returns phone calls. In my experience it is nearly essential for a SUT to have various easy-to-implement grounding adjustments to minimize hum. The K&K Premium has non-solder jumper links on the circuit board that quickly and easily permit optimization. If you have a very low-output MC, the K&K Premium is available with Lundahl LL1941 transformers that will provide the higher gain needed. These are links to tests that Stereophile’s Art Dudley did about ten years ago. The first one is a test of the K&K Basic SUT, which has since been upgraded with an improved transformer. The Basic (US $325 kit, $385 assembled) has three gain settings, but they are changed with soldered jumpers. The K&K Premium tested here has two switch-selectable gain settings. The second link is to another test Art performed on several SUT’s ranging in price from the entry level K&K to an Audio Note that at the time was approaching $9,000 US. Money spent on quality internals, not fancy labels. The feet, secured with screws, are a step up from stick-ons that fall off in a year or two. Enough foreplay then, let’s get set up to listen to some music. I connected the K&K Premium to my eight(!) 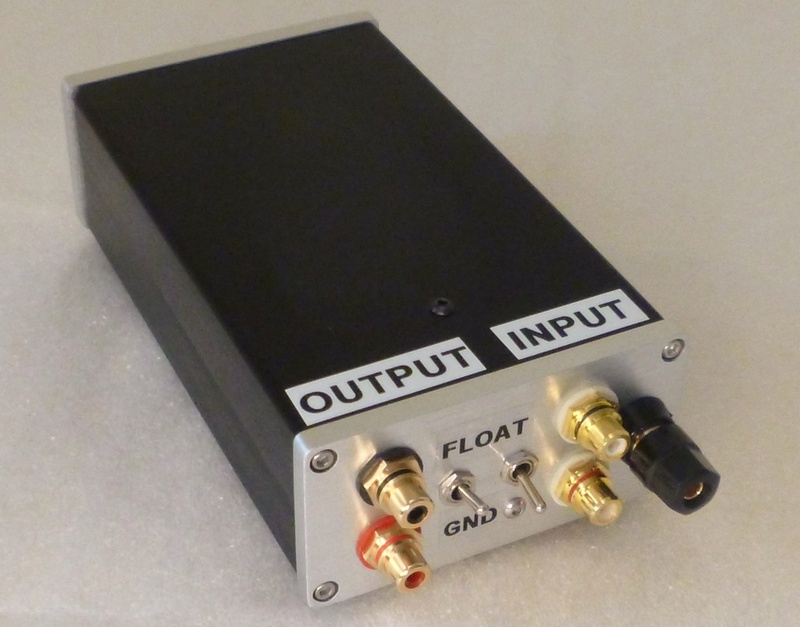 tube, two-chassis Aikido phono stage, and, at the other end of the price, device and twitchiness spectrum, the RJM Audio opamp-based solid-state unit. The TT, my first in over 40(!) years, was the Euro-spec Pro-Ject “The Classic” SB SuperPack with Ortofon Quintet Red MC cartridge. The Q Red is Ortofon’s entry level, low-output MC cartridge. It requires a very high-gain phono stage – or a SUT – to raise the voltage level to that required by both of the above-mentioned phono preamps. Ortofon’s specs suggest that the Quintet Red should have a load impedance greater than 20 ohms. That’s not very specific so in essence what they’re suggesting is experimentation. I’ll cover the effects of various loading resistors in the listening evaluation. After many years away from black disks, it has taken me some time to retune my ears. They sound at once, and I’m talking about really good pressings here, less bright in the highs, but more detailed in that frequency range than CD’s. This seeming contradiction was both perplexing and to some degree disconcerting. Rather than waste time trying to figure it out, I just spun some LP’s and let music flow. Of course, the transformer’s influence on the sound cannot be separated from the sound of the cartridge, but by using two phono stages, some insight was gained. I also swapped out the K&K for a cheapo, homebrew SUT using some old microphone transformers that I found on eBay for $75 Cdn the pair. I’m always looking for a bargain solution I can pass on to you faithful Wall of Sounders on a strict budget. I’ll provide details of the homebrew SUT at the end of this report, in case anyone wants to duplicate it. In aid of my favourite charity, Georgian Bay General Hospital, the DIY Cheapo SUT that I made is for sale. This may be a subjective statement, but the sound using the K&K was a truly pleasurable experience. In many ways I felt like I’d discovered music again. The whole system has a top to bottom coherency that is instantly engaging. Other audiophiles and even non-audiophiles were drawn in by the sound. In fact, a buddy went out and bought the two disc, 45-RPM Kind of Blue reissue after hearing it on my rig, even though he already has the standard single-disc 33-1/3 version. To be honest, the bass was a little bit plummy and loose. Not slow, just not as taught as it perhaps could be. I don’t think this behavioural trait can be assigned to the K&K. The Cheapo SUT (see below) exhibited the same behaviour. Both transformers did this to a lesser degree with the RJM phono stage compared to the Aikido (see my RJM review). My system (ARC Ref 3, ARC Ref 110, PSB Platinum T8’s, PS Audio power regenerator) could, I think, be described as nearly full-range, so the lack of bass grip is noticeable but not very objectionable. In a system with less bass extension, this quirk might even provide a welcome bit of warmth to the overall sound. This might be more problematic in a system with monster Wilsons, or expensive subwoofers, but chances are such a system would be sporting a much higher-achieving and consequently more expensive analogue front end anyway. I consider the less than ideal low-bass grip, compared to digital sources, a decent trade-off for the superior midrange and highs from these analogue source components. Through all genres of music and various qualities of recordings, musical enjoyment was the order of the day. Everything seemed to be in balance, though obviously the higher the quality the recording the better the sound. It would have been nice to really put the K&K through its paces with a more upscale cartridge. I might sneak one into next year’s equipment budget. A friend who’s also an audiophile reported that the K&K Premium worked well with a Denon DL-103 (LOMC). Resistors? We don’t need no stinkin’ resistors! Oops, sorry, kind of lost it there. Towards the end of the review process, I decided to experiment with various cartridge loadings by connecting resistors across the SUT secondary windings. How does this work, you might ask? Let me trot out another one of my automotive metaphors. Image the SUT as the transmission of a car. This is easier to imagine if you think of a manual transmission. If, from a stop, you try to move away in say, third gear, it won’t be very graceful. The car might buck and the engine might lug or even stall. On the other hand, imagine pulling onto the highway and leaving the car in second gear. You might get up to highway speed but the poor engine will be revving its heart out. By the way, for you non-motorcyclists, one of the thrills of riding a sportbike is doing exactly that. It’s a bit of a cheap thrill, but a thrill all the same, winding out a sportbike engine in second gear and breaking any speed limit in the land. But back to our SUT – the transmission, if you will, between the MC cartridge and the phono preamp. We want to select the correct gear (cartridge loading), that will yield optimum sound. 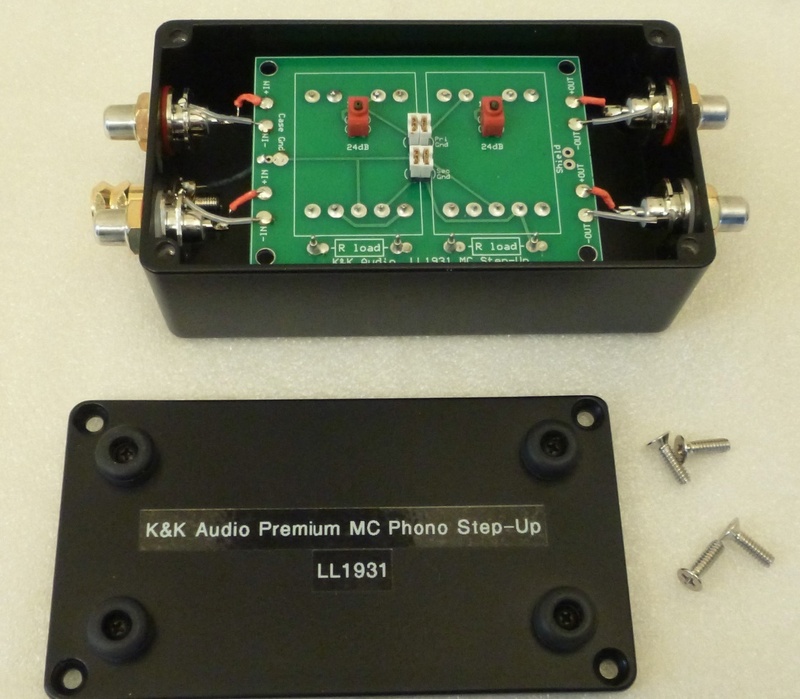 The K&K Premium has two gain settings, 18db and 24db, and the loading varies between the two gain settings. Resistors offer a way to fine-tune the cartridge loading. 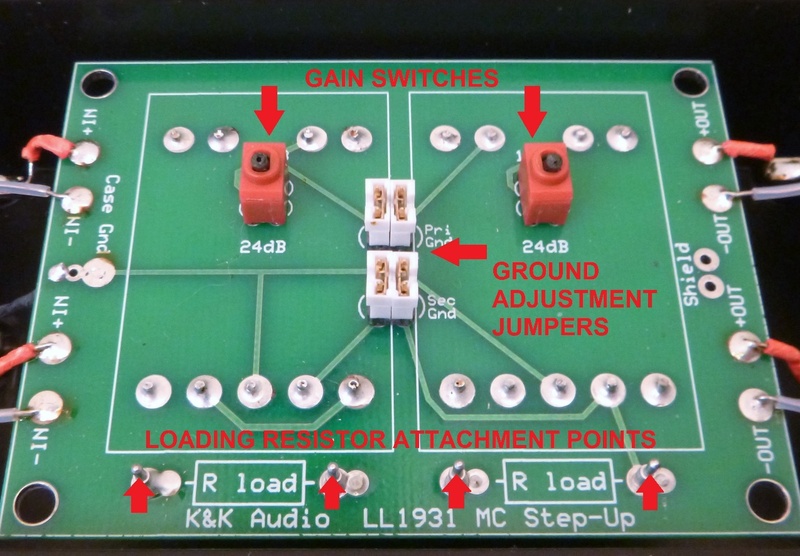 The resistors are placed across the secondary of the transformer as shown in the K&K applications guide (previous link above). This secondary loading is reflected back to the primary and on to the cartridge windings, similar to the way a transmission links the speed of the wheels to the revs of the engine in a car. The K&K website states that, “A typical MC cartridge will sound somewhat “lightweight” when it is loaded too lightly (load impedance is too high) and will sound somewhat dull when the load impedance is too low”. In the high-gain position, without resistors, the Quintet Red cartridge is loaded at about 180 ohms (Ω). Adding a 46,000Ω resistor loaded the cartridge at about 90Ω. The slightly loose bass noted above tightened up somewhat. Adding other resistors to load the cart. at about 65Ω and 45Ω tightened up the bass a little bit more each time. By the time I got to the 45Ω loading, the highs started to lose some of their airiness, and in general, the music lost some of its brio. Music just didn’t seem to breathe and flow as well as it did with the higher loadings. The effects were subtle, but noticeable, in back to back listening. I didn’t perceive that it sounded “lightweight” when loaded too high, just the aforementioned slightly loose bass. To effect the loading, I just wrapped the resistor leads tightly around the pins, see picture above. 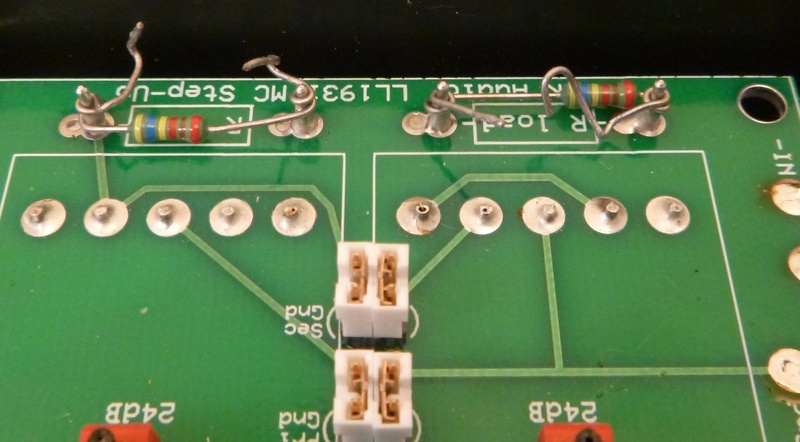 Once the optimum resistor loading is found, they can be soldered in place and the leads trimmed. For the rest of the review, which consisted of mostly listening for pleasure, I used the resistors that gave me the 90Ω loading. If buying one of the K&K SUTs, you might get Kevin to include a few inexpensive resistors of various values. Once you find the one you prefer, solder it in, or order a pair of fancy, bespoke resistors from one of the usual suspects. (Editor’s note: the usual rule of thumb is to load a LOMC at 10-20x its specified internal impedance. At least as a guide or starting point). The DIY cheapo had more gain than the K&K had in its low (18db) gain setting, and even a bit more when the K&K was in the high (24db) setting. From what I have been able to deduce, the old Bogens have a 50 ohm primary impedance and a 47,000 ohm secondary. The input impedance on both of the phono stages used for this review had the standard 47,000 ohms. The Quintet Red (minimum 20 ohm load) was probably presented with semi-appropriate loading when used with the Cheapo. I burned it in for several days feeding a CD player (playing a CD on repeat) into an inverse RIAA circuit, feeding the audio signal to the Cheapo SUT. I used the same procedure to burn in the K&K. All in all, the sound of Cheapo was not that bad. Right from the get-go it was punchy and did not offend. It carried a tune well, pace and rhythm were as good as the K&K. I noticed no loss of toe-tapping. The K&K is a higher resolution device all round than the Cheapo though. That’s as it should be, considering the K&K costs nearly a grand in our money to land one in Canada. The Cheapo was less dynamic as well, and didn’t have quite the same high frequency extension as the K&K. I have no doubt a higher performance cartridge than the Quintet Red would show up greater differences between the K&K and the Cheapo. But if budgetary pressures force a low-cost solution, the DIY alternative is not that painful a compromise to make. My curiosity got the better of me wondering if the K&K loaded to 50Ω would still beat the Cheapo. Yes, it did. With resistors selected to effect a 50Ω load, the properties that distanced its performance from the Cheapo were still in evidence. 50 ohms is likely the lowest loading suitable for the Ortofon Quintet Red. It is possible to raise the 50Ω loading of the Cheapo, but it requires a bit of surgery on the phono stage. The 47,000Ω resistor at the input of the amp could be changed out for one of a higher resistance. If the K&K Premium exceeds your budget and you don’t want to go the DIY Cheapo route, detailed below, the K&K Basic SUT will more than likely be up to the task. Maybe I should rename the Cheapo though, it sounds like one of the Marx brothers. Let’s face it, SUT’s aren’t cheap. In fact, they seem down right pricey when you consider that the actual transformer itself can usually be hidden inside an adult’s closed hand. Just for the heck of it, I searched Moving Coil Step Up Transformer and MC Step Up Transformer on eBay, and all number of things popped up. A couple of items advertised as transformers for $35 were not transformers, but solid-state gain stages. Real transformers were available for up to $10,000 a pair! One item that caught my eye was a pair of Bogen T-157 microphone transformers. These were likely removed from an old studio mixing console or P.A. amp and are probably at least 50 years old. The seller, in Markham, Canada, was asking $75 CDN for the pair. 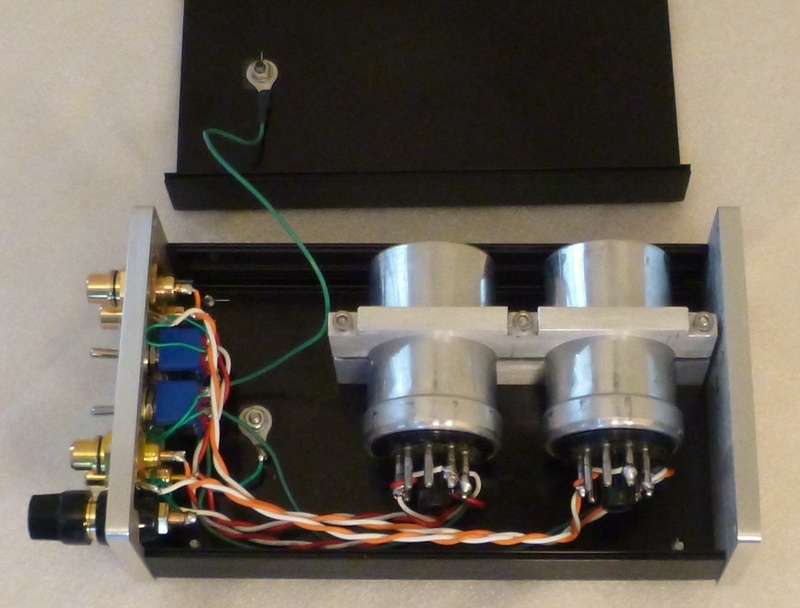 Microphone transformers serve the same general purpose as moving coil SUT’s and can have approximately the same characteristics. I did a little online searching and found a forum where some people had actually used them as SUT’s for MC cartridges. I haven’t found complete data for the Bogens, I have limited patience with search engines, but a little research suggested that the T-157 and the T-155 might make half decent MC transformers. If any Wall of Sound’ers wish try their hand at a DIY SUT of their own, search Bogen T-157 and Bogen T-155 on eBay as well. The Bogens might not pop up on a general SUT search. So yet again, I decided to take one for the WoS team, and gambled that a pair of Bogen T-157s might do the job. I already had some switches and jacks, and with the addition of a low cost, eBay-sourced chassis from China, I had a potential bargain SUT. A little bit of lathe work from my buddy Richard, and with Dan of Midland Tool and Machine letting me loose on one of his milling machines for half a day, I was able to whip up the cheap and cheerful SUT you see here. This bargain special could likely be duplicated by a reasonably handy person with a soldering iron and access to a drill press. The custom clamp securing the two transformers (made by good-guy Dan at Midland Tool and Machine) is a bit of overkill. Some double-sided tape would likely hold them in place adequately. If you are wondering why I soldered wires directly to the pins instead of using sockets, these are not a standard octal like is seen on a 6SN7 or EL34. There are nine pins on the transformers, not eight like the standard octal. Sockets for these 9 pin octal-like transformers are as rare as hen’s teeth and consequently very pricey. Besides, a soldered connection is far better than just a pressure connection fit from a socket. When dealing with sub-millivolt signals from an MC cartridge, soldered connections are the way to go. The switches perform the same function that the jumpers do on the K&K, namely they switch transformer primary and secondary grounding on and off to facilitate hum minimization. If you decide to go the DIY route, it’s possible to eliminate one or more sets of connection interfaces by replacing the input and/or output jacks with lengths of interconnect wire terminated with RCA plugs. Taking a step back and thinking of the performance of the Cheapo, it seems appropriate that I only paid $75 CDN (roughly $60 US) for the pair. Of course, there are all sorts on eBay trying to flog any old transformer as a potential SUT. There are legitimate SUT’s for sale on eBay as well, but the prices can be, shall we say, suspect. When a pair old of transformers starts to creep over the $100 US mark, I tend to think it’s not worth the gamble. Especially as many are sold without any guarantee as to their electrical condition. I might have just gotten lucky that the Bogens I bought worked out OK. At $100 US or more per pair, and if budgetary issues are imposing a DIY solution, then buying new, true SUT transformers is worth considering. K&K offers the Lundahl LL9226 transformers used in their Basic SUT kit for $172 US a pair. These offer various gain/loading options that most old microphone transformers do not. Other options in true SUT’s are available from Jensen and Sowter, though they are a bit pricier than the entry-level Lundahl. I had promised some grounding tips in this report, but my word count has, as usual, grown way too large. These will be published very soon in a separate mini-report, with lots of pictures. Watch this space or sign up for new article notification by email. If anyone would like build details on the Cheapo DIY, leave a request in the comments box below and I will oblige. Your chance to own the Cheapo! I’m putting the Cheapo DIY SUT shown above up for auction. Like all of my WoS projects, the full sale price, less shipping, will be donated to the new equipment fund at my local hospital, Georgian Bay General, in Midland, Ontario. I have about $150 invested in this little gem, not including my labour and the good will of those who helped. I’m opening the biding at $125 Canadian (roughly equivalent to $100 US) plus delivery. I’ll accept payment by Interac Transfer or Western Union money transfer in Canada, or Western Union anywhere else. It’s too much of a pain in the neck getting money out of PayPal so it’s not an option. Transfers online can be done on the WU website. If you are seriously interested, place a bid at cheaposut@gmail.com I’ll close the bidding two weeks after this article hits the WoS site. No low-ball offers please, this is for charity after all. I’ll notify the highest bidder, get a shipping quote and send Cheapo SUT off once payment has been received. The buyers of my other WoS projects have been pleasantly surprised with the performance of their purchases. I’ll bet that the Cheapo has the highest price to performance ratio of just about any SUT going. Sure, it’s not an Ortofon, Audio Note or K&K, but it’ll likely give up more music per dollar. If you are the high bidder what you save by purchasing the Cheapo SUT, you can spend on records. And when you listen to those records they’ll sound better and you’ll feel better knowing the money you spent went to a worthy cause.